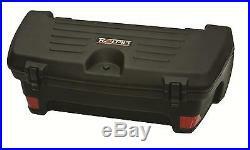 Kolpin ATV Rear Trail Box. Contoured design allows for maximum use of rack space. Large storage area that fits up to 2 XL helmets with extra storage room. Double wall lid construction for added rigidity allows for extra weight. Roto-molded UV-stabilized LLDPE (linear low-density polyethylene) construction. Separate heavy duty keyed lockable center latch. 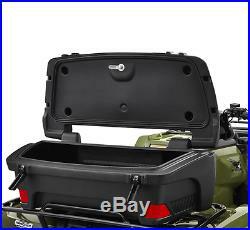 Dimensions: 37'' l x 17.3'' w x 13.6'' h.
The item "Kolpin Rear ATV Trail Box Rack Storage Trunk Helmets Gear Lockable Weatherproof" is in sale since Wednesday, March 1, 2017. 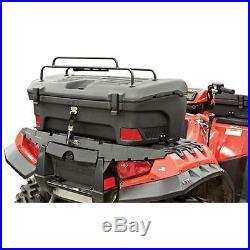 This item is in the category "eBay Motors\Parts & Accessories\ATV, Side-by-Side & UTV Parts & Accessories\Body & Frame\Racks & Luggage". The seller is "jt_cycle" and is located in Athens, Tennessee. This item can be shipped to United States, Canada, United Kingdom, Australia, Mexico, Germany, Japan, Denmark, Romania, Slovakia, Bulgaria, Czech republic, Finland, Hungary, Latvia, Lithuania, Malta, Estonia, Greece, Portugal, Cyprus, Slovenia, China, Sweden, South Korea, Indonesia, Taiwan, South africa, Thailand, Belgium, France, Hong Kong, Ireland, Netherlands, Poland, Spain, Italy, Austria, Bahamas, Israel, New Zealand, Philippines, Singapore, Switzerland, Norway, Saudi arabia, Ukraine, United arab emirates, Qatar, Kuwait, Bahrain, Croatia, Malaysia, Brazil, Chile, Colombia, Costa rica, Dominican republic, Panama, Trinidad and tobago, Guatemala, El salvador, Honduras, Jamaica, Viet nam.